Photo courtesy of the HECA website. Editor’s Note: The following is from a press release issued April 4 by our friends at Hold Erie Coke Accountable. 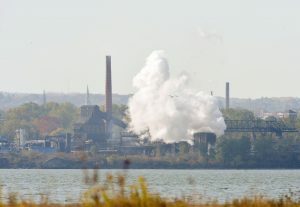 Hold Erie Coke Accountable (HECA) is partnering with the Group Against Smog and Pollution (GASP) to update the public on Erie Coke’s ongoing violations and the high stakes impact for Erie’s quality of life and prosperity. The event, “Erie Coke Plant Community Impact Update,” will be held from 6:30 p.m. to 8 p.m. Tuesday, April 16, 2019 at the East Middle School Auditorium, 1001 Atkins St. Erie, PA.
A panel of environmental scientists will address Erie Coke’s operation and impact on air quality, water quality, and soil contamination. Also discussed will be the recent closing of Erie Coke’s sister plant in Tonawanda, New York, and insights into the on-going enforcement actions by the Pennsylvania Department of Environmental Protection (DEP) on the plant on Erie’s waterfront. GASP Executive Director Rachel Filippini and staff attorney Ned Mulcahy, who will review regulatory affairs specific to coke facilities and their impacts relative to a healthy population, environment, and economy with insights on how GASP works to hold polluters and regulators accountable. Regulatory offenses by Erie Coke continue even as the plant has re-applied for its federal operating permit. Currently levied by the DEP are 53 infractions composing an administrative order to be addressed as part of the permit review process. At issue is Erie Coke’s impact on clean air, water, soil, fish, and the residents of Erie who are working to position Erie as a great place to live, work and play. HECA is a non-profit, non-partisan citizens and community initiative, inspired by the civic resolve that Erie’s rise as a leading 21st Century city of choice rides on high quality of life and a healthy environment, requiring that the Erie Coke Plant be held accountable to operate in a safe and violation free manner for the safety of all.